Hiroshi Fuji and Slow Art Collective, Kaeru, 2012. The Arts Centre, Melbourne, Australia. Image courtesy of Chaco Kato. Cost Details: AUD43,000 + in-kind support. Location Details: Hamer Hall, Arts Centre Melbourne, 100 St. Kilda Rd, Melbourne, Victoria, Australia. 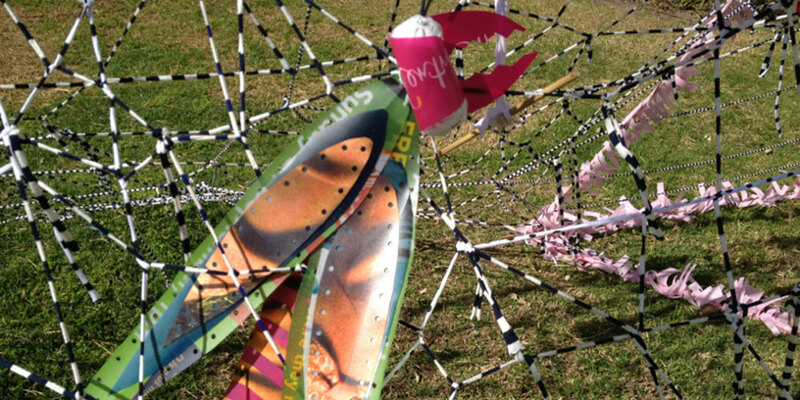 Workshops were held on the front lawn outside Hamer Hall and the installation took place on the upper terrace. Date of Delivery: 1 August – 30 September 2012. Medium: Installation of recycled objects. 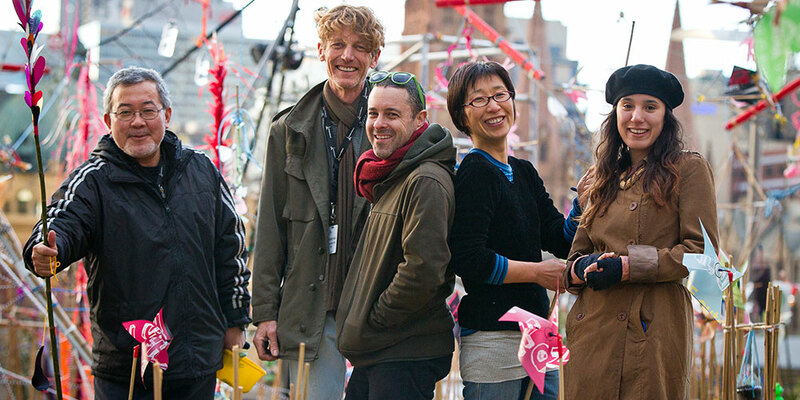 Project Delivery Team: Arts Centre Melbourne staff, RMIT students, interns and volunteers. 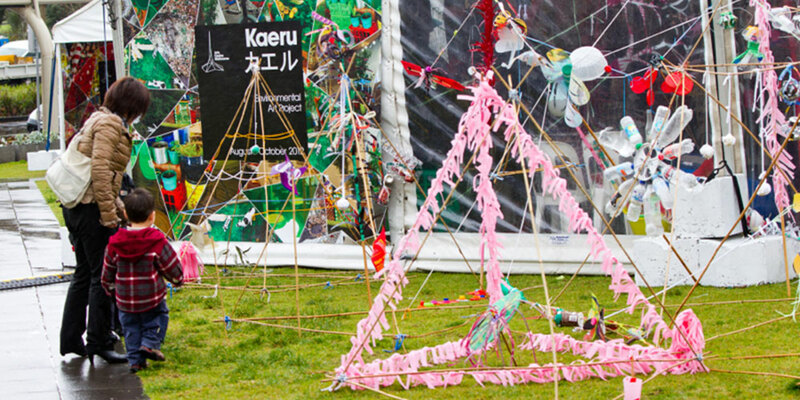 Kaeru was a collaborative community project about waste, renewal and transformation. 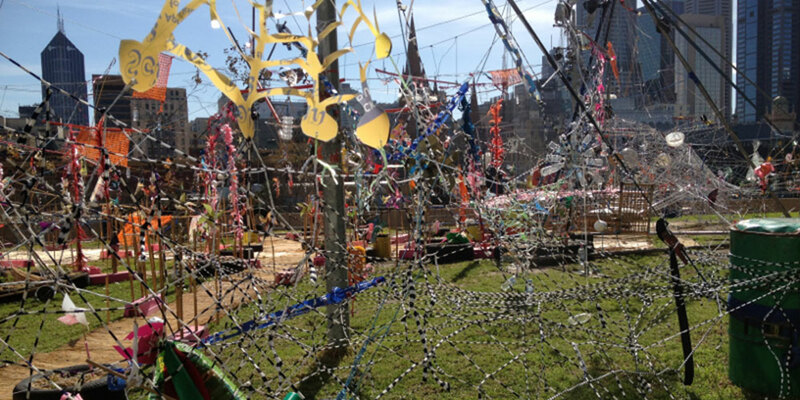 Japanese installation artist Hiroshi Fuji undertook a four-week residency in Melbourne and worked with Slow Art Collective to produce an interactive garden installation made entirely from recycled objects. The Kaeru project took place over two months. 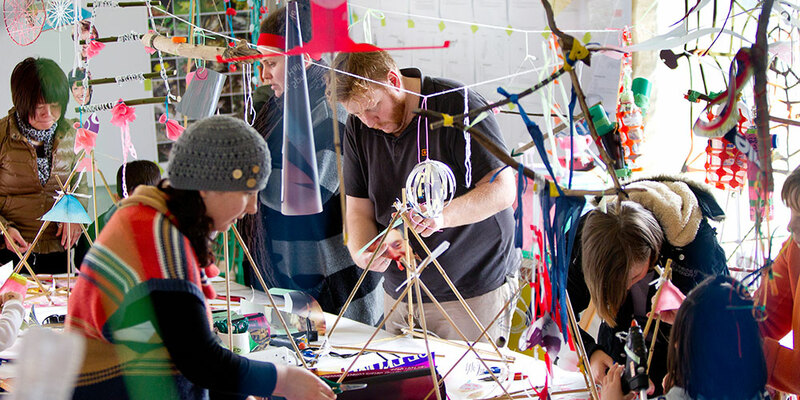 The first month comprised workshops and a drop-in studio where visitors could participate by making sculptures and objects from discarded materials. During the second month, Slow Art Collective and Hiroshi Fuji created the Kaeru: Secret Garden installation using all the objects created in the workshops. Kaeru: Secret Garden was created on the upper terrace of Art Centre Melbourne’s new Hamer Hall and was open for the public to visit and spend time in. Aesthetic/Visual: Slow Art Collective and Hiroshi Fuji aimed to create an engaging multi-media environmental space from readily available recycled materials. The found and donated materials the artists acquired largely governed the aesthetics of the project. The foundation materials for the work were over 200 large posters or ‘backlits’ used by Arts Centre Melbourne to promote their theatre and music program. Audience Engagement: The artists wanted to create a collaborative project that encouraged various communities and audiences to engage with it in different ways. In the lead up to the project they held a community call-out for people to donate materials. The artists used on-site signage and social networking as means for collecting materials. Social Activation: By asking Melbourne residents to collect PET bottles and donate old household items, the artists aimed to raise awareness about waste and the amount of rubbish that is discarded on a daily basis. 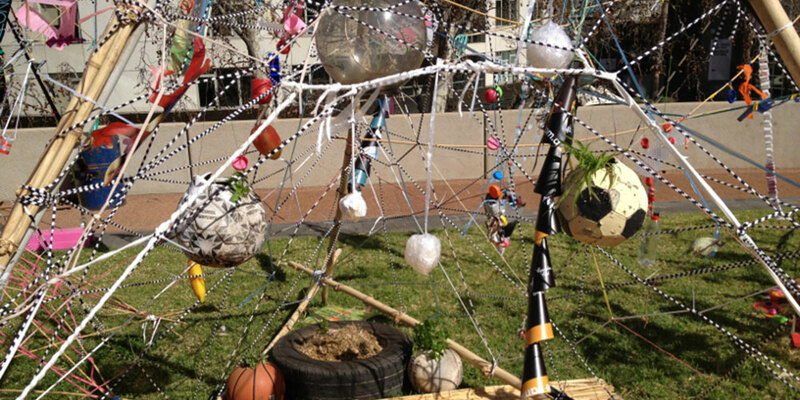 Social Inclusion: The artists offered an open invitation to school and university students, artists and the general public to be involved in the creative process of constructing objects for the Kaeru: Secret Garden installation. 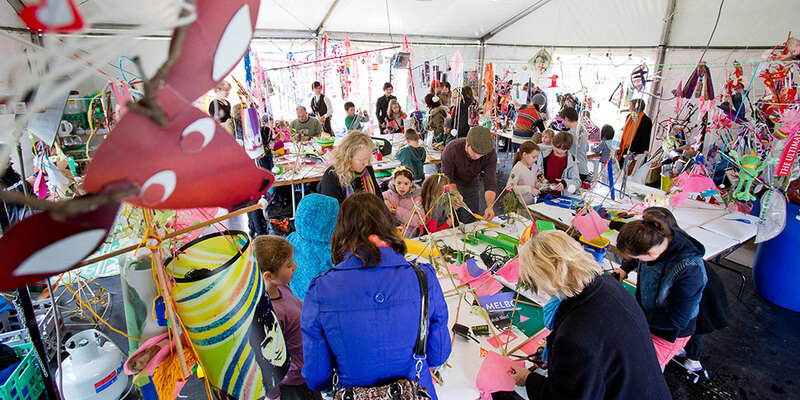 During the Open-Studio month Arts Centre Melbourne held extensive public programs to attract different groups from the community. A specialised ‘Kids and Families’ program was also organised. 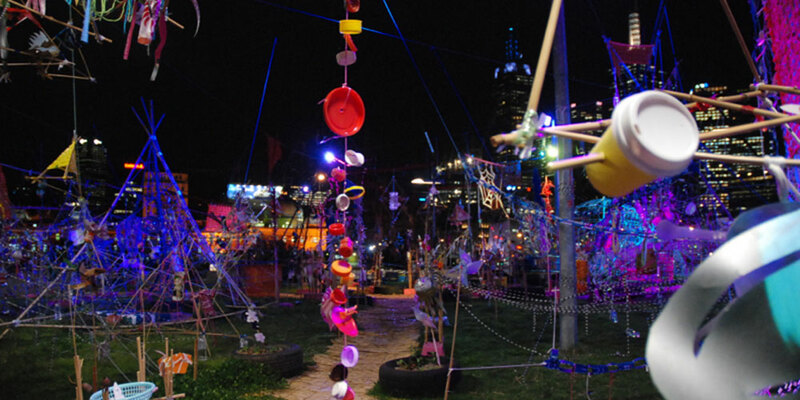 Students from RMIT University Public Art were invited to engage with the project at different stages. Waste Reduction: Within their art practices, the Slow Art Collective and Hiroshi Fuji share the approach of using recycled materials. They applied this approach in creating Kaeru, using only recycled and found objects. Aesthetic: Slow Art Collective and Hiroshi Fuji’s ideas for the aesthetics of the work developed and changed throughout the duration of the installation in response to “different factors”. Kaeru: Secret Garden on the Upper Terrace was very well attended, as people would notice it from various parts of the city or when on a tram passing by. Often they would get off the tram to come and have a look. The Hamer Hall is located in close proximity to the National Gallery of Victoria, Federation Square, the Yarra River and Flinders Street Station, and has a constant stream of passers-by and commuter traffic. After the Hall’s two-year closure, the bright and colourful installation on the Upper Terrace attracted curiosity and attention. Community Development/Education: Some of the school teachers who attended the public programs with their students showed interest in the methodologies and materials the artists used in creating Kaeru: Secret Garden. 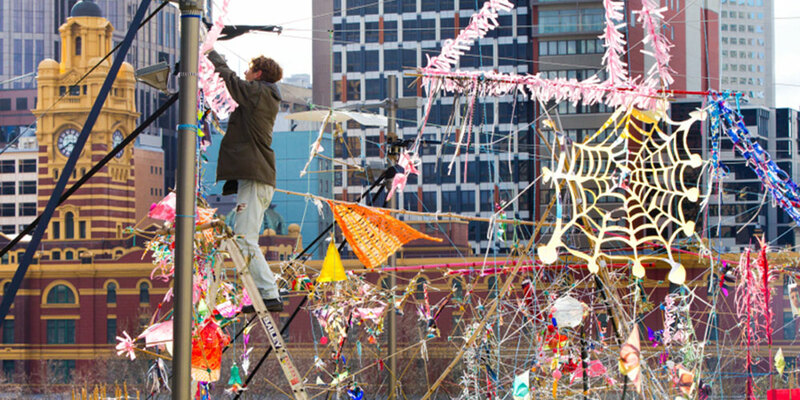 Tony Adams believes, “this seemed to inspire them to investigate more experimentation in what constitutes ‘art’ materials.” In addition, the artists’ incorporation of Arts Centre Melbourne’s backlits in the installation led to local school groups being interested in regularly collecting out-dated backlits for use in their art classes. After meeting Hiroshi Fuji on a previous visit to Melbourne in 2011, Arts Centre Melbourne was interested in engaging the artist in a sculptural project. As part of the program of celebrations to re-launch Hamer Hall, Arts Centre Melbourne’s cross-cultural department commissioned Hiroshi Fuji and the Slow Art Collective to collaborate and create an interactive installation that engaged key issues relating to sustainability. The artists proposed the format of the work including the workshop tents on the lawn area and the Kaeru: Secret Garden on the Upper Terrace. The project benefitted from being part of the larger program of events to re-launch Hamer Hall, with cross promotion creating additional interest in the work. The natural and spontaneous progression of the work created by the public participation presented only small and easily solvable issues. The main problems that arose were with the maintenance of the Kaeru: Secret Garden installation, which was exposed to the elements and Melbourne’s temperamental weather. The Slow Art Collective tended to the installation daily to check for and repair any damage. One of the biggest unknown factors was the, at times, strong wind from the Yarra River. Tony Adams describes, “the artworks from the workshops were made from relatively lightweight materials by participants using modest methods of adhesion (i.e., string, tape, hot-glue) and skill.” The Slow Art Collective was unsure if the materials would last the four weeks of the installation and so enhanced the installation with potted plants and grasses to bring life to the work. The engineers report and site risk assessment indicated that the installation would be required to be closed to the public if wind speeds exceeded 55 km per hour. This happened on two days, but minimal damage was done to the installation. The Kaeru project was environmentally low-impact as it was created on-site from salvaged materials. Slow Art Collective are always engaged with the maintaining the smallest environmental footprint possible with their artworks and are particularly interested in the lifecycle of the materials and resources utilised. At the end of each project, all items are broken down into material groups and saved for future projects. [It] became a bit of a spring clean for the Arts Centre and the staff. Also, the staff would regularly bring ‘stuff’ down to us that they wondered if it could be useful. It was sort of an informal waste audit of the Arts Centre. Adams, Tony. Interview by author, December 6, 2012. Arts Centre Melbourne. “Kaeru – Environmental Public Art (Japan).” The New Hamer Hall. http://www.hamerhallopening.com.au/opening-celebrations/kaeru-environmental-public-art-project-%28japan%29.aspx. (accessed January 17, 2013).